The Kepler telescope was relieved of planet-hunting duties back in August, when researchers determined that failed alignment hardware, necessary for the spacecraft's proper function, was beyond saving. At the time, NASA said it was open to ideas on how the otherwise functional spacecraft might be put to new use. Now, the Agency has settled on a proposal that could see the scope resume its planet-hunting mission. The failed hardware is called a reaction wheel, and its job is to exert a small force that can turn the telescope over time. At least three of these wheels are required to keep the telescope staring at a specific spot long enough to gather useful data. The new proposal would effectively turn the probe's solar panels into a third reaction wheel—though an extremely limited one. As photons are absorbed and emitted, they generate a small force on the object doing the absorbing (it's the same force that causes some asteroids to spin). Kepler is powered by solar panels that are arranged symmetrically across the probe's long axis. If the probe can be oriented so that the sunlight strikes these panels evenly, the photons will exert a constant and symmetric force against the probe. Kepler's two remaining reaction wheels can then push against that force and keep the telescope gazing steadily at one point in the sky, just as it was designed to do. 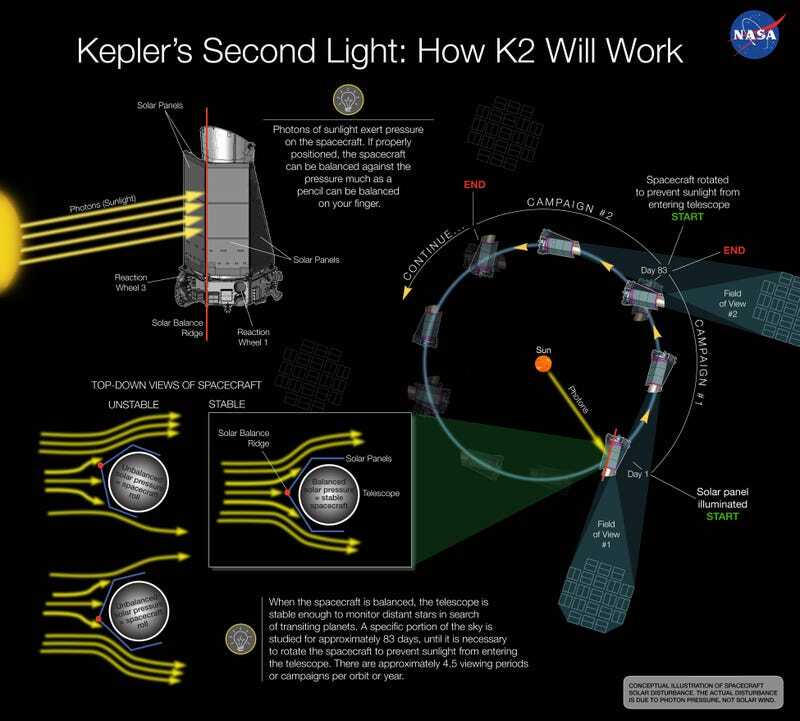 More info on Kepler's newly minted "K2" mission at arstechnica.